20% Off First Orders at Roman Originals New to Roman Originals? Save 20% on your first orders! 20% Off Orders with Newsletter Sign-ups at Roman Originals Sign up to the newsletter and save 20% on your orders at Roman Originals. 25% Off with Friend Referrals at Roman Originals Refer a friend to Roman Originals and both of you will get 25% off your next order! Shop 50% Off in the Spring Sale at Roman Originals - Including Jackets, Tops & Trousers The spring sale is now on at Roman Originals! Discover 50% off jackets, tops, trousers and more! Discover the Holiday Shop from £22 at Roman Originals - Shop Tops, Dresses & Trousers Whether your jetting off to a sunny beach or exploring cities, Roman Originals have got those holiday must-haves for you! Free UK Delivery on Orders Over £20 at Roman Originals Spending over £20? Qualify for free delivery on your orders at Roman Originals. 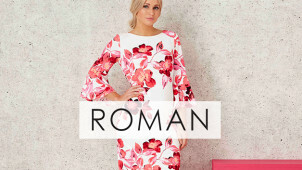 Save £50 on Dresses & Jumpsuits in the Spring Sale at Roman Originals Find your perfect Spring wardrobe and save £50 on your orders at Roman Originals. New Season Arrivals from £20 at Roman Originals - Get Ready For Spring! Update your wardrobe ready for Spring and shop the new season must-haves from Roman Originals. Gift Cards from £10 at Roman Originals Treat them to a gift card starting from just £10 at Roman Originals. Established in Birmingham in 1957, Roman Originals evolved out of a manufacturing business to turn into the influential womenswear brand that we see today. With fashion that is designed for the high street, yet crafted with sumptuous Italian fabrics to make each piece look and feel like a luxury high-priced item - for t-shirts, shirts, trousers and knitwear to gorgeous evening dresses and occasionwear too - the Roman clothing catalogue is brimming with inspiration to update your wardrobe today. Whether you like to dress to impress, or to feel stylish and comfortable while on those day-to-day errands - you’ve met your style match with Roman. Scour the collections online, and shop Online Exclusives to add an extra edge to your wardrobe, with prized goods that you won’t find in-store. This is where you’ll be able to find confidence in every outfit, with clothing to suit every occasion. For a wedding, party or perhaps an up and coming holiday - now you don’t have to panic when you have Roman on your side. How do I use my Roman Originals discount code? If the offer doesn’t require a discount code, your savings will be included automatically. Sign up with your email address to receive the latest information and offers from Roman Originals. What size should I order in Roman Originals clothing? Roman Originals designs ladies fashion in sizes 10 – 20, so you’re guaranteed to stumble upon a flattering item which compliments your shape and style when you shop online today. Use the size guide online to be sure that you order the correct size for your clothing! Find a Roman Originals clothing store near you using the handy store locator. Does Roman Originals offer gift cards? Yes! You can let your nearest and dearest choose from the beautiful goods on offer with a Roman Originals gift card that can be used online or in-store (excluding concessions). You have 30 days to return unused goods via the post or to a stand alone store. You will need to pay for postage, find more information here. Email: customerservice@romanoriginals.co.uk or use the contact form. For all the truly elegant fashion that your heart desires, look no further than the feminine designs from Roman Originals. From everyday apparel to evening and occasionwear - use a Roman Originals discount code to save on outfits fit for every occasion. The Roman Originals collection is a favourite among modern women. Feeling tempted? You’ll be surprised how much you can save on a new outfit with help from vouchercloud. By creating an Account with Roman Originals, you will be able to enjoy even more of this brilliant world of beautiful clothing. As well as easy transactions with your contact and delivery information already stored, you’ll also be able to create a Wishlist for all of the pieces that have caught your eye as you browse. With order tracking and more to access via your account, it’s a no-brainer for style updates made simple. Shop with Roman Originals to have the pick of the most stunning evening dresses for the next special occasion on your calendar. Buying a new dress can feel too indulgent when money is tight, but with a Roman Originals voucher code to cut the cost of the price tag, you can afford to make sure you feel utterly fabulous. Choose from contemporary little black dress designs, floral prints, or sleek shift dresses to name but a few eye-catching style available online, and get ready for your event with Roman Originals.